My mum sent me to Sunday school when I was very small. You might have had a similar experience. And although I can’t claim that my education in religious matters was very thorough, I am pretty sure that I was never told that Jesus Christ wasn’t really crucified and that he lived, and later died, in Japan. You too, eh? Funny how we could have been so misguided isn’t it? 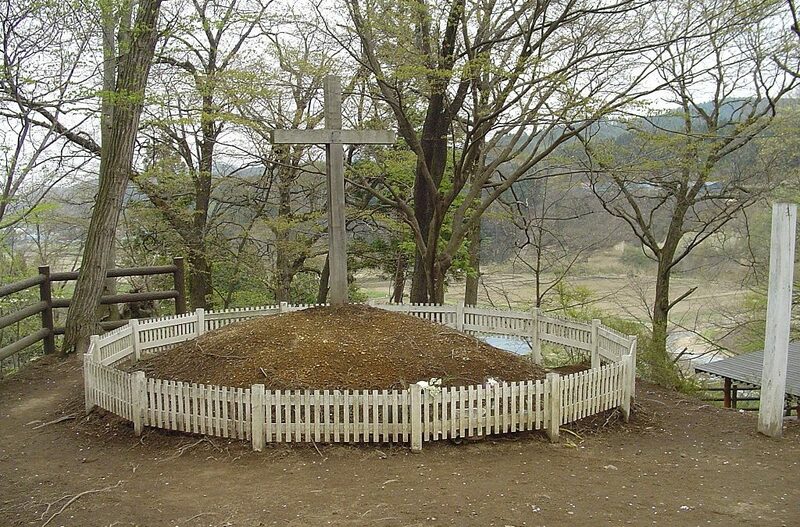 To me, it’s a bit like all those Elvis sightings that go on from time to time but nevertheless, there’s a small town in Japan called Shingo where the ‘tomb of Christ is situated. Well, a wooden cross is, anyway. The story goes that Jesus spent eleven years in Japan, pre-crucifixion, and while he was there (presumably) he managed to acquire a brother named Isukiri. Yes, I know, that sounds like a Japanese name to me too. Imagine Mary ‘Oh yes, I’ve got two sons you know, Jesus and Isukiri’. It just doesn’t work to me. However, Jesus and Isukiri returned to Judea, Jesus being full of the philosophies he had been taught in Japan. These were considered most unsuitable and it was for this reason that the populace decided he needed to be crucified. Cunningly though Isukiri took Jesus’ place and it was he who was nailed to the cross. (Look, this is on Wikipedia and all over the place on the internet. I am not making this up). Jesus escaped. He travelled via Siberia and back to Japan. He carried with him a lock of his mother Mary’s hair and one of Isukiri’s ears. He returned to Shingo where he became a rice farmer. He married, had children and in due course (quite a lot of due course) died right there in Shingo. At the age of 106. And you can go to his grave – see the photograph above. There are three crosses on the mound. Previously Jesus had buried his mother (well, a lock of her hair) and his brother (or rather, his brother’s ear). Although one thing puzzles me. We know that Jesus was a carpenter and he had many many years in which to make ornate crosses to mark the final resting place of his mother and brother – their bits and pieces at any rate – and for himself for when his time came.